Last night, Charlie was wired before bedtime (not unusual). We did our nightly routine of jammies, vitamin, teeth-brushing, a sippy cup of water, and three books. Chuck and I took our turn kissing him on the forehead and bidding him “sweet dreams.” However, several minutes after we had left the room, I could still hear Charlie whimpering and crying in his room. I asked him what was wrong, knowing the answer. What kid likes to be left alone by Mom and Dad in the dark? So I laid down next to him in his snuggly twin-sized bed. As we lay, noses just inches apart, he told me about his day, and the games he played with his cousin Lucie that evening at the playground. He threw his little arm around my neck and commanded me, “Hey, come here. Get closer.” And who was I to deny him? I have always been a diva when it comes to sleep. Whereas most people need 7-8 hours per night to function, I’ve always been more in the 8-9 hour range. In my teens, I could literally sleep until 4 PM. (Obviously, my 30-year old self cannot even fathom this. Think of all I could get accomplished in that time now!) So, as most expecting parents are apt to do, I conjured up in my brain the kind of strict, sleep-Nazi authoritarian Mom I would be. My children would sleep in their own beds, in their own rooms from a young age because Mommy needs her sleep. 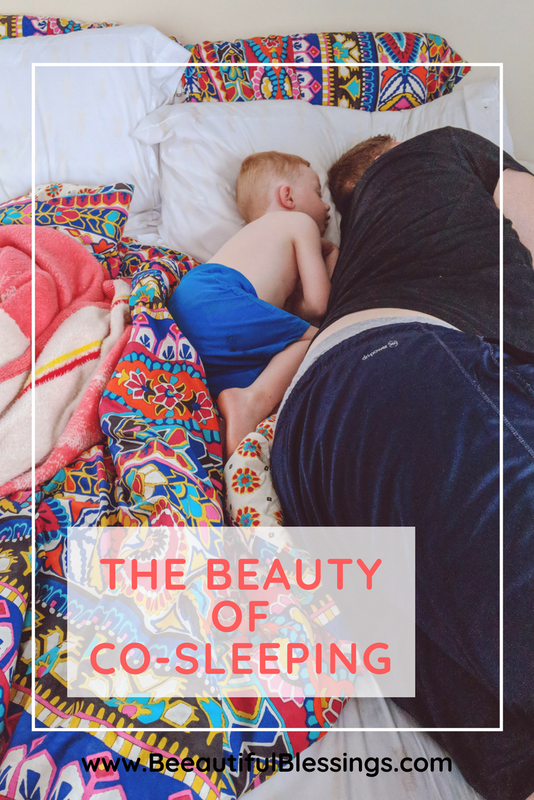 And also like many expecting parents, the reality of actual parenthood settled in and I was shocked to find that the whole co-sleeping thing is kind of glorious. Charlie slept through the night in his own crib form the time he was 8 weeks old. Thank goodness too, because I don’t know how I would’ve managed going back to work when he was 10 weeks old, otherwise. He’s always been independent and a good sleeper. But right around the time he turned three, he started developing a fear of the dark. The first few times it became an issue, we tried persuading and encouraging him to go back to his own bed. But it didn’t last long. Not only was I too tired in the middle of the night to fight with him, but I also remembered just how scary nighttime can be as a little person and I hated the thought of leaving him alone and scared all by himself. I wanted him to experience the security and reassurance in knowing that he would always be protected if he chose to climb into Mommy and Daddy’s bed. So that’s where we’ve been for the past year. Sometimes he does well and sleeps like a log in his own big boy bed. And sometimes he wakes in the wee hours of the morning and quietly curls up between our feet. Crosby is going on two and though he is also a really good sleeper, he wasn’t always that way. It took him over a year to begin sleeping through the night and his 18-month sleep regression was rough. 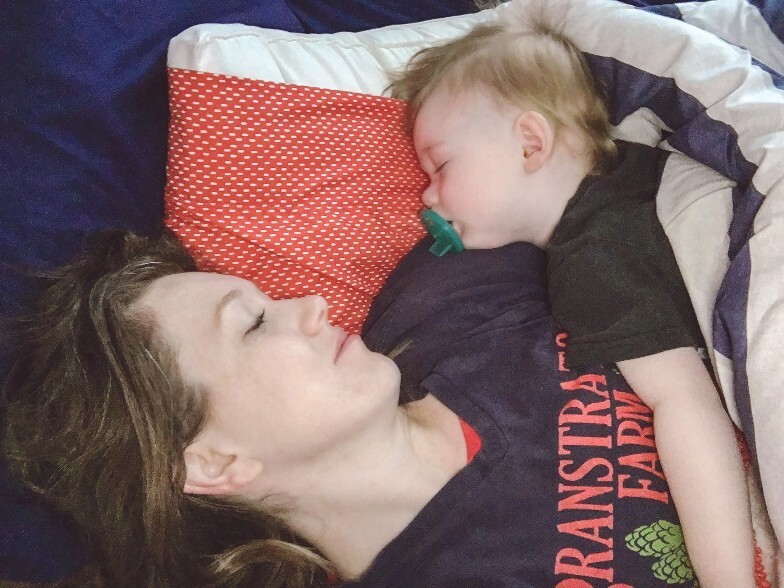 Thankfully, his nursery doubles as our guest bedroom and there have been many a night when rather than opting to let him “cry it out” alone in his crib, I held him to my chest and lay with him as the warmth of my body slowly lulled him to sleep. Sometimes, all a little boy needs is the embrace of his Mama. Now that I’m working full-time again, I treasure the nights when I get to snuggle these little boys of mine. During the week, I have a few hours with them to tackle dinner and bedtime and then our weekends are always jam-packed with my part-time job at the Farmers’ Market, studying for my professional exams, and swimming lessons. Sometimes we get caught up in all of the activity and it feels like I haven’t actually seen and spent time with them in ages. These are the times when I’m so thankful that Mama cuddles are the best cure for restless nights. These are the times when I’m reminded of just how fleeting time is and these precious little souls won’t want to sleep alongside their parents for much longer. These are the times that make me believe in the beauty of co-sleeping.